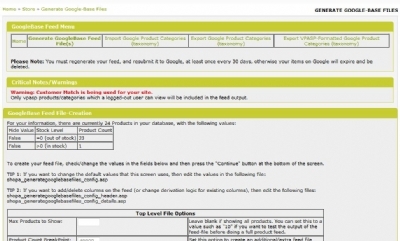 Create a GoogleBase Data Feed file at the push of a button from your VPASP Admin area. Includes a Google Taxonomy (Product Category) Import/Export Facility and corresponding poplist for it on your edit-product page. 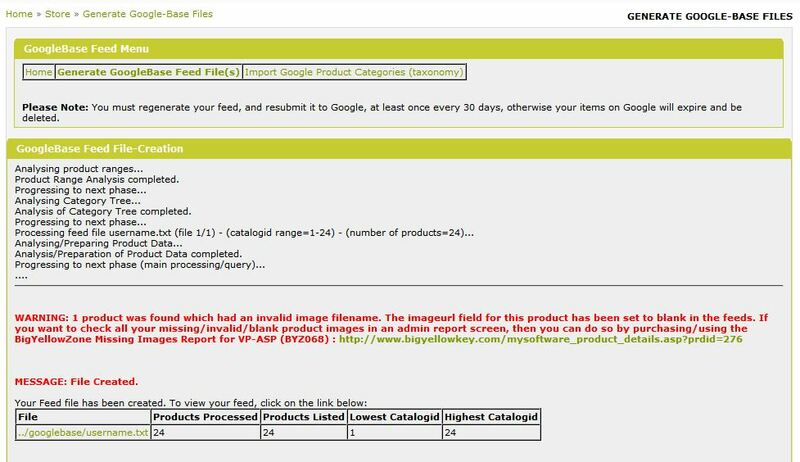 Feed Generation Parameter/Submission Shows you a summary of how many products you have, broken-down by in/out-of stock and hidden/non-hidden). Lets you enter lots of different options (the default values in the parameter screens can also be changed by tweaking a config file). Feed Generation Results Summary Shows you the progress as it's going along. Optionally (via a config option) tells you how many of your products had blank images (either blank in the data, or stamped on the products but not physically existing on the server). Tells you how many products got included in the feed etc, and gives you a direct link to the generated feed file so you can download it to your pc once it's been generated. Feed Generation Results - Screen Output Allows you to output a copy of the first "x" records of the feed file to the screen so you can check the values/logic without having to open the feed file. Also gives you the option of being able to see the corresponding images that are in your image columns in the feed. Taxonomy (Google Product Category) Upload/Import Submission Press the browse button, pick your file from your pc via the windows file-browsing window that comes up, press the upload-file button, then press the start-import-process button, and your excel "taxonomy" spreadsheet will automatically be imported into a reference table in vpasp for you. 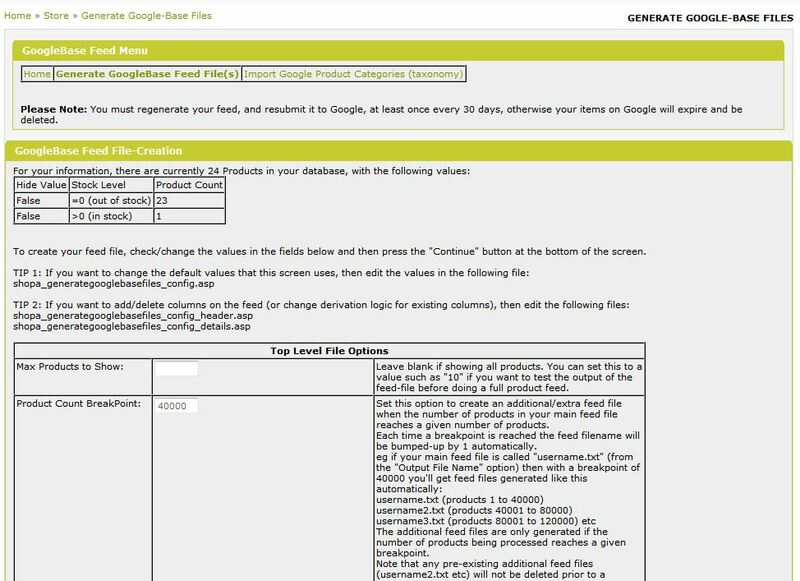 You can download the taxonomy excel file from google, and use auto-filter on it to delete categories that are irrelevant for your business/site, and then upload/import that trimmed-down excel file so that you don't get thousands of irrelevant categories in the edit-product taxonomy poplist. Taxonomy (Google Product Category) Upload/Import Results Tells you how many categories records got imported into the vpasp "taxonomy" reference table (this table is specific to BYZ056, it's not used by the rest of vpasp). Edit-Product Page's Taxonomy (Google Product Category) PopList (optional) You can optionally add a taxonomy poplist to your edit-product page simply by pasting a couple of extra lines in your shopa_addproduct.asp file (detailed instructions included with the addon). Runs direct from VP-ASP Admin. 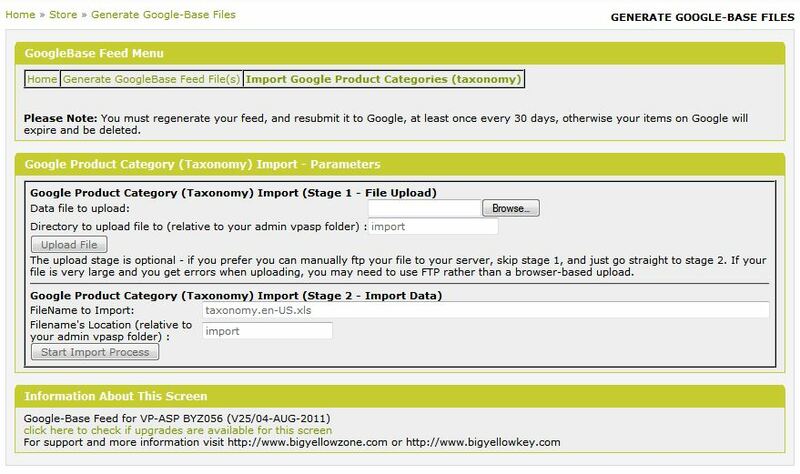 Includes a facility where you can import the google "taxonomy" (google product categories) from the google taxonomy excel file into vpasp, and then you can use that for a poplist so that you can stamp your google taxonomy onto individual products (all code for this and notes on how to do it are included in the addon). This feed is highly flexible; you can source your feed data from any columns you want, and the logic that outputs the header and the per-product details are split-out into separate easy-to-tweak files. Loads of options are available such as setting the maximum number of products to extract (useful for testing). Lost your trimmed-down excel file that you originally imported your taxonomy into vpasp with? No problem; you can export the Google Taxonomy from vpasp back into an excel file, and tweak it and re-import it again. Want to get a list of the imported taxonomy in "cat1 > cat2" format so you can copy/paste it into, say, BYZ089? No problem; there's a second export option which allows you to export the taxonomy in that format too. Caters for all GoogleBase formats (ie all countries) due to its flexibility. Allows you to split the feeds into separate files automatically using configurable break-points. Allows you to create "split" (variant) rows in the feed for size/color permutations etc. Very flexible; has top-level configuration options, as well as separate header/detail configurable files which allow you to output whatever info you like. Highly tuned to increase speed and reduce memory usage as much as possible. On 22-Sep-2011 Google will be enforcing their new feed rules stringently; you need to have V25 or later of BYZ056 if you want your feed to continue to be accepted by Google after that date. Does your shop use different logic to normal? (eg you allow people to pre-order some products, maybe you don't use standard stock level options etc) - no problem, the bit that outputs the individual product details is very easy to change, and you can follow the existing logic in that file to see how to add "if" statements etc - It's very easy to tweak to fit your own site's/products' feed requirements. We know that Google constantly change their rules, and that different shops will have different rules/logic for different products etc; the entire structure of our feed has been setup to take that into account so that you can easily set your own output/rules. No. Our feed is completely different to VPASP's own GoogleBase Feed, our one works in a completely different way, has lots of extra options/enhancements, and is structured in a much more flexible/easy-to-tweak way. If you notice any similarity between the 2 feeds, then bear in mind that we created the first version of our feed in 2004, and the vpasp one came out about 5 years later, and that we've been maintaining our own feed to keep up with different versions of vpasp (and different google rules) constantly since 2004. We do-not/did-not license/sell/give our feed code to VPASP for them to sell; our feed is only available for purchase via bigyellowkey.com. 01 14-DEC-2004 Initial version - Big Yellow Zone Froogle Data Feed Utility For VP-ASP. (single new version created from previously separated versions of BYZ002, BYZ009, BYZ010, BYZ011 which are now redundant following this combined new single version). 04 10-FEB-2006 Changed documentation to be VP-ASP V6-compliant. BYZ036 Upgraded from V01 to V02. No changes to the main froogle-file generator files were made. 05 06-MAR-2006 Enhanced to add missing/invalid product-image check as a new option, and submission screen format improved and parameter-field notes clarified. 07 05-AUG-2006 Enhanced to add special-character translation and to use Google Base logic/fields instead of Froogle. 08 06-AUG-2006 Added extra notes to documentation/screen to warn of excel de-formatting date fields and to explain character translation. 09 11-AUG-2006 Changed default config options and added more character translations. Added character translation to label-extras values as it was previously not used. Added Supplier logic to the Brand field source options. 10 16-AUG-2006 Changed/corrected the translation logic. Enhanced the label fields construction to avoid spurious commas, spaces, and duplicates. 11 18-MAY-2007 Changed to be compatible with VPASP V6.5. Brand - existing attribute now always added to the feed, but allows blanks. Condition - new attribute added and made compulsory, and corresponding config options created. Location - new optional attribute added, and corresponding config option created. Product Type - new attribute added and made compulsory, and corresponding config options created. Label - changed to custom keywords attribute. Category - new custom category attribute added. Substantial changes made to configuration options/logic and field derivation logic following recent changes to Googles specifications. Changed config variable to avoid possible conflicts with other BYZ Addons (particularly with the CMS Addon, BYZ110) - tconfig_striphtml has been renamed to tconfig_gbf_striphtml. 14 10-OCT-2008 Changed to tune (speed up) the processing of the products when generating the feed file. Changed to ReDim some arrays to help reduce memory usage. 15 25-OCT-2008 Added weight and payment columns. Restructured to make it easier to add/change column derivations to the feed output. Restructured processing for supplier fields to avoid additional calls to the database for each product record. Added printing of dots and flushing to help avoid timeouts. Changed to deal better with the SQLServer text column (memo) bug. 17 24-FEB-2009 Change of fields (category) logic following the withdrawal of the c:category field from GoogleBases specifications (changed c:category to use c:shopcategory instead in the header file). 18 21-JUL-2009 Added new functions which help keep comma-separated values below a certain number (eg for keywords). This is needed because GoogleBase have now started to restrict the number of comma-separated values allowed inside custom attributes to be no more than 9. See the Tip (restricting CSV values) topic within the BYZ056 readme file for more info. 19 25-AUG-2009 Changed price logic in the feed to take account of minimumquantity of product if set. Note that googlebase now force you to show the (minqty*unitprice) as your price in the feed file when you have a minimum quantity set for the product in question, failure to adhere to this will cause the corresponding items to be rejected by google. 20 03-DEC-2009 Added new config options (tconfig_gbf_columns_to_query_products and tconfig_gbf_columns_to_query_categories) to allow you to speficy columns to select from products/categories (instead of the default select *) which can be used for sites which have very large numbers of products to help minimise memory usage on the main queries. 21 05-DEC-2009 Added extra config option (tconfig_gbf_breakpoint_productcount) for break-points when very large numbers of products are listed, and changed feed generation to create additional feed files at each break-point reached. Added sql connection timeout setting so that long queries dont time out. Tuned bottom-level category logic to use a temporary table to store the levels and trees. NOTE: The tuning aspect of this version is a considerable improvement for large databases and will speed up the feed a lot. 22 01-JAN-2010 Changed to be compatible with VPASP V7 (this version does not cater for situations where xSEODynamicEnable=Yes). Added new config options (tconfig_gbf_default_parent_exc and tconfig_gbf_default_child_exc) to be able to optionally exclude parent and/or sub products. Added version control settings to the bottom of the shopa_generategooglebasefiles_config.asp file. 23 13-FEB-2010 Added calculated category tree branch description to the end of the select-list to help avoid cursors being blanked out due to sqlserver bugs. 24 08-MAR-2010 Corrected a bug which was not allowing the last column in the products table to be found when using the BYZ_GBF_COLUMN_VALUE functions in the details config files. 25 04-AUG-2011 NOTE: Your feeds will fail soon if you are still using a version of BYZ056 that is older than this version. Please note that as from 22-Sep-2011 (when Google start enforcing their rules more strictly), you will need to be using V25 or later of BYZ056, otherwise your feeds will fail. Added Google Product Category (taxonomy) import/logic. A very large number of enhancements/changes have been made regarding the feed field source/logic on this version, and extensive changes made to the readme notes, and to the comments in the header/details config files. This version of BYZ056 has been brought into line with the latest Google specs, and if you have an older version of BYZ056 then you will need to upgrade it if you want your feed to pass validation (especially after 22-Sep-2011 when the new rules will become strictly enforced by Google) or if you want your feed to be in any way workable/maintainable. For this version, all the googlebase feed program files have been changed, and new files have been created, and some files have been deleted. If upgrading from a previous version of BYZ056, then please backup all your existing shopa_generategooglebasefiles* and byz$056_version.asp files, then delete them all from your site, then re-install/reconfigure BYZ056 from scratch using the latest version of the files and using the latest installation notes (the only change you wont need to re-do is adding the googlebase feed to your admin menu; everything else needs to be re-configured/re-read etc). Also, if upgrading from a previous version, and if you have BYZ163 installed, then make sure you re-apply the relevant changes to make the googlebase feed use static urls (see the BYZ163 usage notes for more info). 26 17-AUG-2011 Added export option for the imported taxonomy so that if you lose the original trimmed-down excel file that you imported the taxonomy with then you can export the data from vpasp back into a Google Taxonomy format excel file, change it, then re-import. Added a second export option so that you can export the taxonomy in vpasp format (eg if using BYZ089 and you want to copy/paste the vpasp-formatted taxonomy, ie literals, not separate columns for each branch). Changed the ordering of the taxonomy poplist in the edit products page (to order by the tree description alphabetically instead of ordering by the row numbers of the spreadsheet that it was imported with). Added productmatch logic (for sites that use the same database but for different sites/shops), and customer match logic, and various other aspects such as logged-in related fields to restrict relevant data from the output. Please Note: If upgrading from a previous version of BYZ056, then you must make sure you are using BYZ038 V13 or above before upgrading BYZ056; V26 of BYZ056 or afterwards will not work if your version of BYZ038 is V12 or below. 27 31-AUG-2011 Added more logic to help avoid cursors being blanked out due to sqlserver/vpasp bugs. Please Note: You must be using V14 or later of BYZ038 before upgrading to V27 or later of BYZ056. BYZ056 V27 or later will not work with V13 or below of BYZ038. 28 28-SEP-2011 Added extra config option (tconfig_gbf_product_whereclause_restriction) and parameter field so that you can exclude products matching a certain criteria from the feed via a where clause restriction (eg to exclude products that dont have a UPC or MPN+Brand on them). 29 01-NOV-2011 Added extra options for Age Group, Gender, Colors, and Sizes, and added extra logic to create split feed rows (for variants), ie to cover all color/size permutations of a given product. 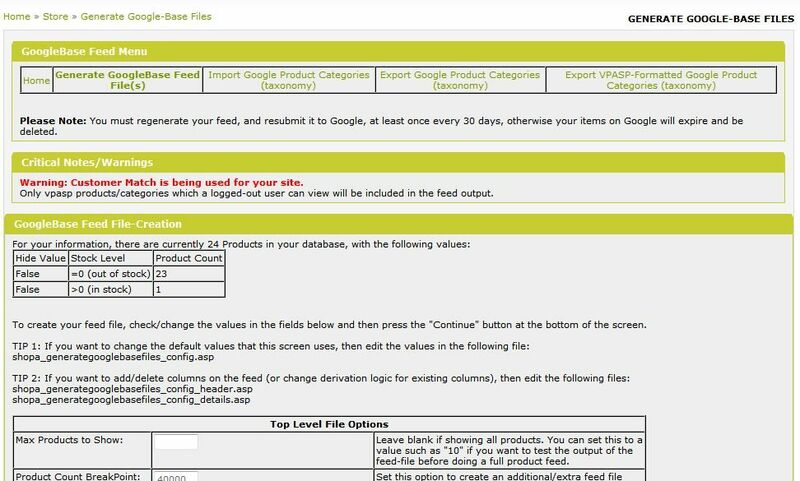 Added extra option to be able to exclude a given product from the feed output during the processing of the product by setting a flag in the shopa_generategooglebasefiles_config_details.asp file. Changed the additional image logic to not output an additional image if its the same url as the main large image thats already specified. 30 10-JAN-2012 Changed the image url construction logic as some permutations of shop urls and image values were not calculating the correct url (and were therefore coming up as missing images). Also changed the file-existence check for images to use a more efficient method. Please Note: You must be using V15 or later of BYZ038 before upgrading to V30 or later of BYZ056. BYZ056 V30 or later will not work with V14 or below of BYZ038. 31 05-FEB-2012 Added new options on the parameter screen (and in the main config file) so that you can output the feed headings/data to the admin screen as well as to feed files (to allow easier debugging/tweaking of the config options and as confirmation that the feed is showing the right type of data and using the right logic etc). 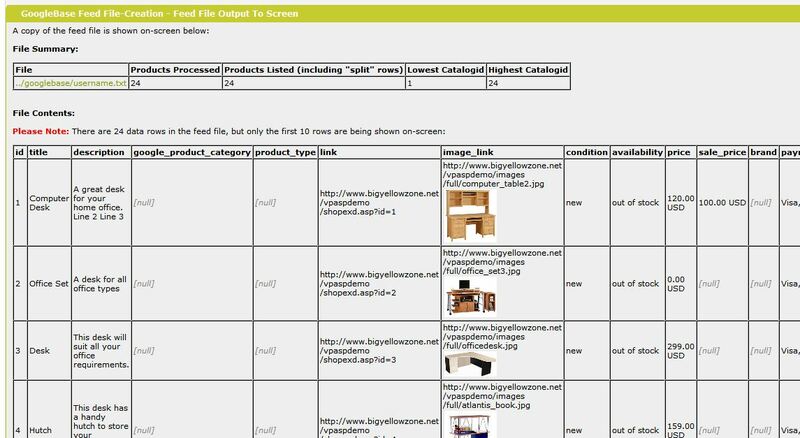 For screen output of the feed files, you can specify how many lines you want to display on screen (eg if you have a feed file of 10,000 products, you can choose to only view the first 10 data rows of the feed on-screen as a double-check before you submit your feed file to google). Corrected the csv-to-arrays function (used for sizes and colors arrays on split-products etc) as it was missing the last returned value in the list (as the ParseRecord generic vpasp function fails to return null values where appropriate). Changed various function calls in the feed to use the new BYZ038 functions where appropriate instead of having a feed-specific version of the function. Made minor corrections to some of the admin screen html. Please Note: You must be using V16 or later of BYZ038 before upgrading to V31 or later of BYZ056. BYZ056 V31 or later will not work with V15 or below of BYZ038.